The above affirmation has been part of my daily practice since 2008. Every morning I start my day with it. I feel the power of my inner light, and I step out into the day ready to embrace the joy and challenge of living in this beautiful world. I’ve spent the past few weeks on an expedition of sorts. I pulled out all of my old journals, went through old blog posts, and really wanted to see who I was when I first started on this journey into spirit. It was a beautiful thing to see the innocence of starting on a spiritual adventure, making the commitment to doing this work full-time, and how I was dealing with uncertainty in those moments. I’ve made a lot of changes since starting this journey (physically and spiritually), but through the digging I was also able to acknowledge the sacred foundation, the unchanging, and am more able now to give those roots a bit more life. I use to be a lot more positive about life, and my journals use to be filled with beautiful affirmations. As of late, they’ve looked more like “whine” sessions. Life grabs us, but light grabs us too. I’ve gone through a lot of transition over the past few months. Making a geographic change, relationship changes, and coming back into alignment with my family. All this change has sent shock waves through my system. Like a lightening bolt hitting the earth and breaking open the surface.. reveling that rich soil beneath the hardened stone. I think too often positive affirmations and books like “The Secret” get a bad rap. A lot of people assume that these tools are just putting masks on the negative, or that they are teaching that we must never have negative thoughts. A lot of people become bound to the negativity, we tend to sit in the struggle for longer than necessary, and we may even lose a sense of worth connected to having “good” in our lives. Positive affirmations are invitations for the good things to come into our lives, negative affirmations are easy… positive affirmations can be more difficult if we feel bound to not being able to see the light in our dark moments. Positive affirmations are pulling up the shades. The affirmations are invitations for us to join life in a different way, to step into life through a different perspective. When we begin to do the work on inviting the positive into our live and work through gratitude, we are doing the deeper work of the soul. We are making claim to our birthright. Engaging positivity also allows us to be less reactive to negative situations. Affirmations, like mantras, help us to train the emotional body, to come back to center, and to see this “negative” situation through a different lens.. thus allows us to work through it, rather than be bound by it. Over the past few days I’ve gone into deep reflection about what I want to do with my life. How do I want to do the work of the soul? How can I be of service to those in my life, and to humanity as a whole? Going through my journals also allowed me to see what my original intentions were for taking the leap into the sacred as a profession. I’ve been truly blessed along the way, and to go back to those moments in my past where things seemed “impossible”, yet there was a current running through my life… one that has never let me fall, and one that stays with me as I move into the next experiences in my life. I say this often, but if you are not journaling, you really need to start. I’m so thankful for all those little reminders, those messages from my past to my future self, that I am not able to read, and to take to a deeper place of understanding. Be the light you want to see in the world. Let you light shine, and set this world on fire with your glory. More changes and movement taking place. Viewed as isolated events they have little meaning. When you connect the dots, as look at these events as a series of symptoms, it’s easy to see that we are in the middle of a transition period. Don’t be afraid and hide in the ignorance is bliss model. Be prepared to help others if something happens where you live. It’s foolish to pretend these things could never happen near us, when we can see that they are happening every day with greater frequency. Preparation, faith and service to others eliminate fear and doubt. At first I sat with this, and then decided to take this deeper into meditation. I know that I personally have been going through this world only giving partial attention to the events moving around me. I move through my spiritual paradigm and do the practice, do the healing, do the work, read books and do my writing. I go to work, teach my yoga, and work with my clients. All along there is a vast world that is moving around me. There are forces that are at work that do not have our best interest in mind. There are movements of love and light, but there are also those that walk in the shadows. Recently a good friend of mine turned me on to Alex Jones and a show called Infowars. I’ve tuned into this show in the past. I’ve also tuned into David Icke, and David Wilcock and have in the past appreciated the information they give regarding the hidden world around us. I think too often in the New Age paradigm we get too caught up in our processes and our own illusions to want to see the world around us. The Old Age paradigms are also not immune to this. We get caught up in celebrating the seasons and the earth, but do not see (or care to see) what is happening in this world. I think that often we use our spirituality to escape reality, and we need to shift that–We need to bring our spirituality into our reality. I am not one for conspiracy theories, but there are things that are happening in this reality that we can no longer ignore. Of course each of the people I mentioned above go deep into their own paradigms. Everyone has an agenda, but we have to start tuning in. Ignorance is NOT bliss. We might not want to turn on our televisions, listen to the news, or tune into this third dimensional space, but you’re not turning on the TV does not stop the world from moving. If you do not know about the disaster how will you activate and send your prayers and healing? If you are not aware of the laws and governmental changes that could impact you negatively how can you effectively use your protection and grounding work? I feel we have a duty as psychic, channels, intuitives witches, and people living this beautiful experience to be aware of how this world is moving, and our place in it. Politics, government, conspiracy, etc can be heavy to sift through. Using discernment is a lost art that is becoming new again. Are you getting caught in the illusion of the distractions around you? How much time do we spend on Facebook? How often to we each foods that damage us? I know I’m ranting a bit, but I feel that it is time for us to wake up. One of the big things I saw coming into this year was a sense of complacency. People felt things were getting easy at the onset of the year, and in some ways this was true. What I saw in the New Year’s eve psychic fair was that we were being given a reprieve. 2012 for many was difficult. It was not an easy year, and for many it was filled with much upheaval. January hit, and things seemed lighter. I warned many of my clients, students and friends to not get caught in the trap of complacency. Stay with your spiritual practices, reconnect and recommit to them, evolve your connection to spirit, but stay the course. We can easily get caught in the glamour of our own experience. As February opened, so did the chaos that was behind the curtain. Just like ignoring the news does not make it go away, ignoring our shadows do not make them go away. We get glimpses of truth, but the distractions grab us and we get lost in our own illusions. This is how it is designed. I cannot count how many times this year I have heard “I feel like something big is going to happen soon”… Just like the birds know before the storm, we too have an intuition that is activating and sounding the alarm. I’ve started making personal changes to my nutrition, my spiritual practice and how I am gathering information. I’ll be posting on this in the near future. It is time for us to open our eyes to this reality, how else are we to create the changes we want? I am also going to be setting up an email address for submissions, guest posts, and am going to be dedicating a night/couple nights a week to a radio show to bring the discussion to a live and archived format. I think it is the activist in me awakening again. It is frustrating seeing so many people not in realization of their birth right…. to be Gods, Goddesses, to stand in their power. I’ve been contemplating this over the past few days and have been researching directions and what I want to do with this. I’ll still be posting here and to my yogawitch.com page. bringing forward information from various websites that I feel helpful to readers and listeners. I am going to cover topics that will not be popular, and I am not going to be pushing a viewpoint. I hope that by presenting information in a unified way that we can start getting a look at the big picture. It is also my hope that we can engage in discussion that will help us to peel back the layers of this onion. We might shed a few tears in the process, but the soup tastes better for it. I’ve also been receiving some interesting channeled downloads and dreams that I will be offering on this new site. I am also going to be teaching developmental on-line workshops to help connect those interested to their intuition, nutrition, and body mechanics. I am also going to be inviting psychics, channels, mediums, witches, healers, yogis, and spiritual practitioners to offer opinions, thoughts and perspectives, debate, and to guest post. I did not expect to write so much, but spirit compelled me to do so. It is time to connect the dots, to live in our purpose and stand in our power. Thank you for taking the time to listen, to share and to be on this journey with me. So, it seems we made it through the Mayan prophesy, and we are moving towards year that is filled with possibility. This past year has not been easy for many. 2012 was an energy that really shook many of us up, and for better or worse we are here. We are entering a time where possibility is unlimited, but we have to begin focusing on what is important–what is it that you truly want from the experience and what are you willing to create? As we move into this new year it is important to not set resolutions but to set intentions. I did feel the rocking that this year gave. Things came into fruition that I never thought would be possible, and things also have started to fall away. The ending of this year for me was filled with accomplishment and alignment. New beginnings are a daily thing, and each day brings new breath. I have a lot that I want to do this coming year, and finishing up my writing projects is going to be a big priority. I am also evolving not only my client practice, but my personal practice. Stagnation is not something that needs to be embraced this year, and holding oneself back from a fully embodied spiritual practice is not something we are going to be allowed to do. This is the year of the embodied warrior. The spirit of movement, flow, transition and owning our many parts. The shadow elements will still be there, but it is important to recognize that they are there to help nudge us along on our journey to self discovery. Breaking free of expectations and letting your life unfold as you want it to. What are you holding yourself back from completing, accomplishing, or doing? Where is your resistance, invite to the table… work through it. My commitment to this year is going to be to get his blog up and active in a new way. I want to take my personal writing to new heights. I was able to finish a manuscript for the Nanowrimo (National Novel Writing Month) challenge and now have to edit and organize it. I am also working on a new book on Yogic Witchcraft, and have a new blog www.yogawitch.com and a wonderful radio show on blogtalk that is really picking up steam (www.blogtalkradio.com/michaelbrazell). I am also taking my personal practice to a new level and am claiming my many parts. I am a student of BlackHeart Feri and recently had the opportunity to ground new energy at the Between the Worlds conference. I am excited to begin this new path of study, and it has already had a profound effect on my life. Yoga is going to be taking a forefront in my journey this year. I am deepening my personal practice but am also going to be offering new classes, workshops, and events geared towards helping others tap into their unlimited potential through yoga, ecstatic practice, and magick. Stay tuned! My partner David and I have done a lot of joint projects this past year, and I am thankful that I have had such a wonderful partner standing beside me through the ups and downs of the spiritual journey. Living a spiritual life is not often an easy one, but having someone who you can share this life with is an absolute gift. He has inspired me to finish my book this coming year and submit it to publishing. He has also inspired me through his tireless work with community to deepen my roots here in the area. I am working on creating and re-launching several of my meetups so that we can create the sacred space needed for touching the sphere of possibility in 2013. There are lots of things that I neglected in 2012, and some things that I did not complete, that I will take into 2013 with renewed energy. I thank all of my teachers, my friends, my clients, my students, my colleagues, spirit, and I thank the breath for keeping me moving–even when it seemed like giving up would have been an easier option. Be ready to see new stuff! What is in your sphere of possibility this coming year? What are you leaving behind in 2012, what are you carrying forward? What are you most grateful for? I first saw this book on the shelf at my book store over a year ago. The title intrigued me so I bought it. It has sat on my bookshelf for over a year, and little did I know the impact this book would have on my life. This year did not start out on the smoothest of notes. It seems that has been the case for a lot of people. This is a year where we begin to come into greater alignment with our “soul self”, or divine nature. We only need to look outside to see that things are deteriorating in rapid speed, but things are also coming together. 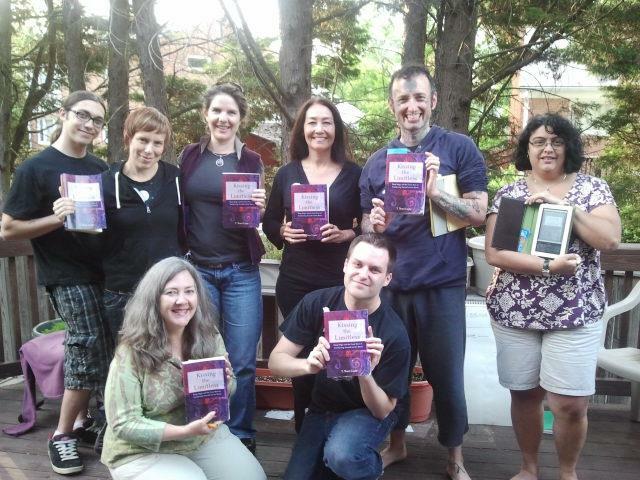 In March I had the opportunity to take T. Thorn Coyle’s “Self Possession” workshop. I really had no idea to expect. I just knew that I was at a crossroads in my professional, personal and well, just overall well-being. I felt that I really had no clue what it was that I wanted to do with this experience, and part of me just wanted to go sit on a mountain somewhere and meditate and live on berries. This would not be the case. 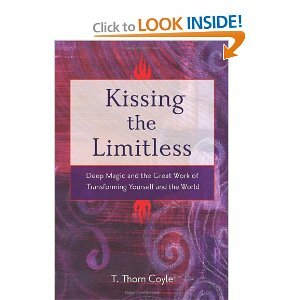 The workshop was based on the book “Kissing the Limitless”, and it is really hard to put into words what happened during that weekend workshop, but the effects of the soul ripples are still being felt. One of the big things about self-possession is coming into your own, and then owning it. As a professional psychic, and one that helps others through difficult times in their lives, I came to a realization that I was not tuning into my own needs. I was not sure how I would react to Thorn’s teaching, but she is a teacher that is truly living her talk. One of the things that we discussed in the workshop was the establishment of a beloved community. The coming together of like-minded people for the cultivation of peace, soul energy, and alignment. Once the workshop was over and we all blew back into our lives, I felt that I wanted to be more like a dandelion seed, carrying this energy back into my own community. I sat with this for a while, and realized the answer for community was sitting on my bookshelf, and my partner David and I decided it was time to start a study group. I looked around our first meeting and we were an eclectic bunch. David and I both lead two very different meetup groups and decided to merge our energies to see what would happen. His group is more focused on magical traditions and mine is geared towards soul/psychic development. What I found even more interesting is that many in the group had bought the book before we even decided to start the group. One of the big parts of the book is the establishment of a daily practice. It has exercises that are challenging and in the introduction you are told it could take a couple of years to fully work through the book. The time limit is variable depending on where you are in your practice, but for many of us it was the first time that we were able to go below the surface. More importantly we were in realization that we were not alone in our struggles. We created safe space for everyone to share where they currently were in their process, but where we wanted to go. The title of the book really sums up what I am hoping this year to be. Each day we are presented with limitless opportunities to grow and to connect. Every breath is a chance to connect to that divine part of ourselves, and for some the road will be easy… for others the road will be challenging. Sometimes the destination is the road, and showing up is so very important his year. I never thought that a book I did not give much thought to would be the thing that would drive me into a completely new direction and focus in my life and work. The beauty of our spiritual path is that it allows us to experiment and step outside of the box. Eclectic spirituality is a blessing in that our teachers show up in many forms, and usually when our guard is down. Here is a wonderful meditation to start off the week. Susan is not only an amazing teacher, but I consider here my spiritual mom. I’ll be doing a post soon on my journey into, and after taking the PAT (Perceptive Awareness Technique) class. Susan is a wonderful teacher, and her classes are a lot of fun. She connect through humor, honesty, and love. You can always tell when a teacher is living their talk, and Susan is most certainly one of those teachers. Susan Zummo is a highly motivated and qualified teacher of higher awareness. She is one of three nationally certified teachers of Perceptive Awareness Technique, Inc. (P.A.T.) 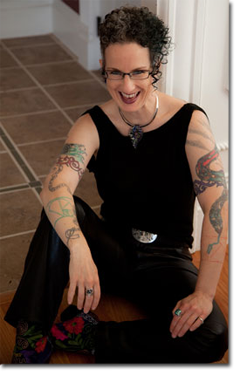 and Soma Pi™ healing, an Integrated Awareness graduate and Intuitive Performance Coach. With over 25 years experience, Susan has been helping students connect with their Higher Mind through Intuitive Counseling sessions, P.A.T. seminars and healing workshops. Her teachings have helped her workshop attendees to reinforce their belief in self and their connection to a higher source. Her workshop participants regard her as one of the most committed and positive spiritual teachers they have had the fortune to meet. Susan’s professionalism and compassion are her trademarks. Most of her students come to her through the glowing recommendations of former students. These lyrics from Song of Tiphareth pretty much sum up what I experienced this weekend at T. Thorn Coyle’s Self Possession workshop. The weekend began with a night of drumming, journeying and community. We moved through a powerful weekend and reached into the depths of our being. So, before I get into the details of what I learned, let’s take a trip backwards in time. At the beginning of this year like many others I faced a lot of upheaval. I felt like the I was a bad puppy and my universe was just slapping me around with the Sunday edition of the Washington Post. At times I felt like I was doing nothing more than spinning my wheels. At worst, I felt like moving to some mountain and just retreating away from the world. This can be especially tough for those of us that are not only spiritual, but we “do spirituality” for a living. I love my work and the connections that I have with those around me, but even that was feeling draining. Now, I’m no stranger to Thorn’s work. My partner David talks about her constantly, and has been to several of her workshops. I’ve had a copy of Kissing the Limitless lying around for about a year. I’d open it on occasion and flip through, connected with some of it here and there, but never really took on the work it was asking of me. In DC we have been fortunate enough to finally have a Pagan community Center come into full manifestation. David thought it would be great to have Thorn come in for a workshop. I tossed out there, that if she did the Self Possession workshop that I would think about going. So, time passed and the schedule was set. More upheaval set in, and David offered to help cover the cost of the class if I would go. So, it seemed the universe was doing everything but driving me to the front door and I took this as a sign to go. So, why all the back story? It is when we are at a moment of defeat, when we finally surrender that we can enter into a state of grace. When we have no other choice but to let go, that the universe aligns every thing for us to come out of that dark night of the soul. I am fortunate that I have wonderful people in my life. The first thing you notice about Thorn is her presence. Her energy is intense, as it has to be for the work that she does. When opening and aligning the souls of others you become a torch that ignites those around you through just your very being. They are the teachers that have actually done the work, they wear their humble nature like a cloak and through them we see that the journey is possible. I also noticed her tattoos, and honestly it was nice to not be the only mega tattooed person in the room. The process of soul possession is about coming into alignment with those sometimes fragmented pieces of ourselves. To love our life not only for the joys, but for the struggles. That we can connect to our innate divine nature through unbinding the energetic anchors we hold onto. Thorn leads the class in a very intuitive fashion. You can see and feel her listening to the soul of the class and this allows her to give our group exactly what we need to facilitate growth. We created Soul Timelines, danced, drummed, chanted, and found little pieces of ourselves that we have forgotten to hug. I am not going to go into every detail from the weekend, as I am still processing much of what I learned. I can honestly say that this weekend changed my life. I am more awake and away that I have been in a long time. My first awakening came from learning the PAT (Perceptive Awareness Technique) from my Spiritual Mom Susan Zummo. I am going to write a blog about that experience soon. The other part that I loved about this weekend was the community that formed through the experience. You do not often see people taking on deeper soul level work. Working through the soul’s energy tends to take us into the deeper, sometimes tougher lessons. Our group was made up of community leaders, practitioners, healers, and seekers. I felt sad when the weekend was over, but know that as we all go out into our respective communities that we take something new back to facilitate an igniting of that soul energy. We are now the torches for our communities and it is time to do this great work. The teacher is that person just a few more steps down the road than we are, showing us that it is possible as long as we keep moving, breathing, and connecting. I offer thanks and appreciation to all of my teachers, those that are known and unknown, the ones that are of this energetic realm and beyond. Also consider supporting her Solar Cross Temple. They do a lot of great work in the Pagan Community: Pagan elder care, prison ministry, environmental work, work with the poor and the homeless. Consider making a donation to help keep this important work moving forward.